Looks like the local civic body need no longer blush over the regular fires erupting at Bellandur Lake. BENGALURU: Looks like the local civic body need no longer blush over the regular fires erupting at Belandur Lake. BBMP, which has deployed retired marshals to guard the lake, on Thursday took four people into custody for burning Optical Fibre Cables on the banks. BBMP has reason to infer that the fires here were caused by humans. Around 6am Tuesday, marshals patrolling the lake noticed a huge fire alongside the lake, and rushed to the spot to see four men burning some materials.Marshal superintendent Wesley Fernandez told TNIE, “A fire broke out here recently, and we had no clue what material was being burnt. In fact, we had been dousing fires whenever we spotted them. But on Thursday morning, when we rushed to the spot, we saw the fire at the lake and also four people burning bunches of cable wires. We nabbed them and doused the fire immediately,” he said. 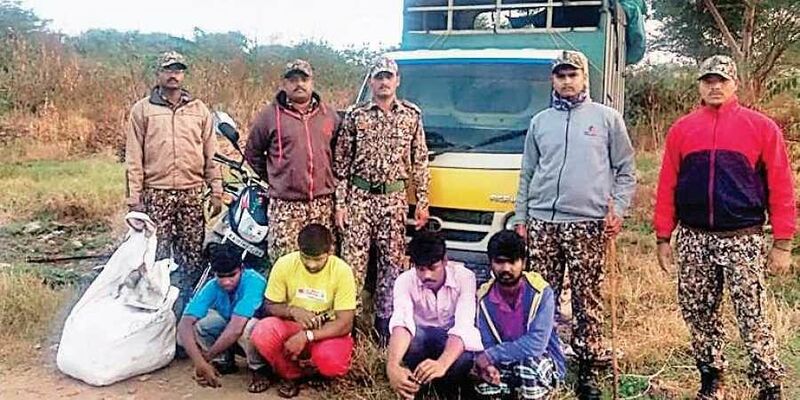 The accused are Senthil, Pandurangan, Prakash and Charanappa, who hail from Dharmapuri district of Tamil Nadu and run a scrap business in the city. Colonel Rajbeer Singh, who has been heading the team of retired marshals in the city, said, “These people run the scrap business in the city and when they find OFC cables, they try to extract copper from it so that they can sell it for recycling. During questioning, they said that each kilo of copper can be sold for Rs400. On Thursday, these people had brought 60kg of OFC and were burning it. We had been observing some activities near the lake and these people were seen near the lake whenever fire incidents had taken place. We also learnt that these people have been doing this for the past two years, and the burning practice caused Bellandur Lake to catch fire in January this year,” he said. Sarfaraz Khan, Joint Commissioner, Solid Waste Management, BBMP, said, “We have nabbed them and FIR will be filed at HSR Layout Police Station against these people. They have been doing this from past two years, and in January, the fire incident took place. Pollution or chemical reaction could be the theory being circulated, but this is the actual reason. In January, it was like spring, and wind dragged the fire into the lake and it spread to other parts. We have conveyed this to the BDA commissioner,” he said. Marshals seized one goods carrier and two two-wheelers . Bellandur Lake caught fire on January 19, making 5,000 defence jawans, BDA and BBMP officials douse the fire. After this, National Green Tribunal slammed local civic authorities and ordered apartments near Bellandur Lake catchment to install STPs. NGT on Thursday directed the state government to transfer D500 crore for the execution of the action plan to clean Bellandur, Agara and Varthur lakes. BBMP will pay D25 crore to BDA over this matter.